This week was one of the most important of the year for this college football season. Although there were few upsets, and ever fewer of consequence (despite some close calls – looking your way, Michigan and Ohio State), there were still two games of enormous importance. Let us start with the biggest game of the week, which was Ohio State playing Penn State in Happy Valley. With a “white-out” at night filling the 107,000-seat stadium, the Nittany Lions played above their No. 10 ranking, almost defeating No. 4 Ohio State. Almost. In the end, both teams played up to their high potential, and the slightly-better team on paper turned out to be the slightly better team on the field of play. The obvious national championship implications of the matchup and outcome is only part of the importance of this game, which shall be explained in further depth in a subsequent article. The other game of enormous consequence was Stanford at Notre Dame. This was another top ten matchup with both teams outside of the South, with the victor having further potential to advance in the rankings. As wonderful as the southern teams are, having a healthy amount of top-ten (or even top-15) teams outside of the Southeast region is good for football because it makes the sport more national and less regional. This importance shall also be explained further in an article that shall be forthcoming soon. Oh, and don’t look now, but Texas is on a four-game win streak, and survived a trap game at Kansas State headed into the Red River Shootout, er, Showdown come Oct. 6. Ticket to die for: none. The only game next week is the annual Army-Navy game. Enjoy, and God Bless America! Not bad for Florida State salvaging bowl eligibility, even if it meant resorting to resuming a postponed body bag game in order to do so. More importantly, though, it boggles the mind why Jimbo Fisher up and left the FSU gig for the Texas A&M job. One would think that would be a come-down in occupations. The Seminoles have multiple national titles to their name, while the Aggies have but one, and that was way back in 1939. Good luck living up to Aggie nation’s insane expectations, Coach Fisher. Meanwhile, there has been much controversy surrounding the fourth team selected into the Playoffs. Many contend that Ohio State should have gotten in instead of Alabama. It would certainly be better for business if we had a traditional power representing the Midwest instead of all four teams being from the Sunbelt. But consider this: scouts who have watched all top teams play live say that they were disappointed in how Ohio State struggled to put away Wisconsin, a team with far few NFL-caliber bodies than the top three SEC teams, Bama included. In hindsight, it ought not to be a surprise how the SEC championship resulted. Auburn was banged up after playing two massive games in a row against top-ranked teams. The Tigers simply had nothing left in the tank come this past weekend. Yes, the Miami Hurricane’s performance was disappointing against Clemson, but their high ranking earlier this season was a reflection on the fact that they were playing ahead of their stage of development. Come next year, they should be more formidable, and thus a more legit contender for the playoffs. One of my favorite conference championship game traditions is the two Big Ten team bands getting together on the field pre-game to play the national anthem together. It’s not only a wonderful sight to behold, but musically it’s spot-on, too, as we can always count those bands to deliver a rousing rendition of the Star-Spangled Banner! Now that the bowl games are lined up, an article on them shall be forthcoming. Until then, let us enjoy the Army-Navy game! What is wrong in Austin? Tom Herman, supposedly a fine, young offensive mind (and Urban Meyer protégé), has not started off his tenure at Texas well. The Longhorns lost, at home, to Maryland, 51-41. The Terps are hardly an offensive juggernaut, either. The loss frankly stinks. What accounts for this? It could be perhaps that Herman has yet to bring in the recruits that he needs to compete at a top-ten level. But perhaps the most likely reason of all is that the Horns were simply looking past Maryland, devoting all their relatively limited practice and preparation time to USC, a marquee matchup that will take place two weeks from now. How else to account for such an embarrassing debut? Let us admit this without hesitation: notwithstanding their close loss today, Purdue’s turnaround performance is quite impressive. Jeff Brohm debuted as the Boilermakers’ head coach in a less-than-ideal match for one’s inaugural game. In this case, it was against a formidable Louisville team, at Lucas Oil Stadium (neutral site) in Indianapolis. On paper, the Cardinals should have made mincemeat out of a Purdue team that, theoretically, would still be recovering from the Darrell Hazell malaise. Luckily for Purdue, that was not the case. The Boilers’ performance has markedly improved on both sides of the ball. Moreover, they played consistently hard throughout the game, and – with the luck of three turnovers by the Cardinals – kept the game close and interesting throughout regulation. If this impressive performance is a harbinger of what is to come, then Purdue shall have a comparatively respectable record despite a semi-brutal schedule. Meanwhile, how rare a treat it is that fans can enjoy a top-five matchup to kick off the season! That is exactly what we the fans enjoyed when No. 1 Alabama took on No. 3 Florida State in Atlanta (played inside the brand-new Mercedes-Benz Stadium, no less). Speaking of great games, another fine example was No. 11 Michigan playing No. 17 Florida in AT&T Stadium in Arlington, Texas. Once again, we the fans got our money’s worth. Sure, there were lots of throwaway games today, especially in the Noon Eastern Time slot. But these two games, along with the Louisville-Purdue game (all three of which were, interestingly, played in NFL stadiums), more than made up for that, and it all adds up to a great start to the 2017-2018 college football season. Let the games begin, and the good times roll! Postscript: Bobby Petrino won an engaging game. Why is he thus “desperately seeking a wake-up call”? Simple reason: his team had three turnovers that game, which were a contributing factor to why the game’s score was so close (seven points difference in the end). Two of those turnovers are at the goal line. Mistakes like that will cost the Cardinals dearly as they delve into the conference part of their schedule. Remember what happened in November of last year? ‘Tis best to fix and pre-empt those mistakes NOW. Speaking of wake-up calls, put Texas A&M down for an honorable mention. There is no excuse to blow a 37-10 lead like that in the second half, with the Aggies allowing the bulk of the scoring in the 4th quarter. For shame, Aggies. Yet, at the same time, good on Bruins’ head coach Jim Mora and QB Josh Rosen for engineering such a comeback. We now await the Committee’s verdict. Just one game: Army vs. Navy – God bless America! The conference championships are now concluded, and shall no doubt yield some excellent bowl game matchups come Sunday. Regarding those championship games, everything ended as anticipated, with a mild surprise of Penn State sort-of-upsetting Wisconsin in a hard-fought, close game that surely gave the fans’ their money’s worth. The MAC championship took on an engaging, intriguing aspect of its own, what with a respectable Ohio U team coached by the venerable Frank Solich taking on the undefeated Western Michigan Broncos, coached by the young, energetic P.J. Fleck. On the line was preserving the Broncos’ first undefeated season since 1941 (which again, “yo!”), and a possible Cotton Bowl berth. A manifestation of this MAC championship game meaning something is that it is the most highly attended in the history of that end-of-season matchup. But anyhow, it’s now time to start talking bowl game matchups, which, as always, shall take up an entire article itself. So, stay tuned. So much for “Texas is back”. After losing on the road to California and now losing on the road to an unranked Oklahoma State, something is wrong. The rot in Denmark is all the more apparent when one considers that A) defense was supposed to be Charlie Strong’s specialty, and yet B), the Longhorns lost to both respective teams 50-43 and 49-31. Notre Dame, it turns out, was highly overrated going into the season. That became rather obvious after getting embarrassed by Michigan State and then laying an egg at home to Duke. Oh, and overrated as the Fighting Irish are, they still scored 47 points on the Horns, in Austin. Let all this sink in for a moment. Once it has sunk in, the logical conclusion is that Strong’s seat cannot get hot enough. In any case, so far what we have seen is that Tennessee is capable of coming back strongly to dominate a rising Florida Gators team. Last year, their problem was that they had to learn to “close the deal,” which they eventually did, but not before losing to both Florida and Oklahoma. This time, their problem is reversed. Instead of needing to “close the deal” – something they demonstrated in abundance last week – they need to learn to play four full quarters of football. Case in point: during the game at Georgia, they slacked off for the entire first half, save for the last drive of the second quarter. In so doing, they spotted the Bulldogs 17 points before they finally decided to start playing with appropriate urgency. That urgency could not have been more palpable than in the final seconds of the game, whereby it took a Hail Mary pass that was actually completed in the end zone (!) for the Vols to come away with the win. Tennessee has no time to take a breather, though, as they face undefeated Texas A&M next weekend. In other news, Michigan beat Wisconsin in a 14-7 slugfest, where both teams kept the ball mostly between the tackles. Both Woody Hayes and Bo Schembechler were nodding approvingly. Interestingly, this was the Wolverines’ first win over a top ten team since 2008. But let none of this obscure the showdown of the week in Clemson’s Death Valley with visitor Louisville. This “ticket to die for” certainly lived up to its hype, with high drama and a back-and-forth score. The Tigers triumphed in the end, 42-36, largely due to the fact that the Cardinals took too long to get going and also because Clemson refused to fold. The fact that the referees did not call Clemson’s subtle holds on receivers at all certainly did not hurt, though it certainly does call Dabo Swinney’s coaching ethics into question. That aside, the Tigers have a clear path to the playoffs, to say nothing of an ACC championship. The Cardinals, meanwhile, still have an 11-1 season for which to play, which would still command a premium bowl berth. Indeed, Kirk Herbstreit insisted that the Cards’ playoff hopes are not dead yet. He may very well be correct. After all, Houston still lurks on their schedule. With all the excitement going on, one is apt to overlook that Colorado is now ranked again (No. 21); they have made the polls for the first time in roughly 15 years. Nice going, Coach Mike MacIntyre! College football in October has started off with a huge bang, for this was one fantastic week for the sport. Next week entails a number of solid matchups (I honestly had to reach for both “Why are they playing” and “They shoot horses, don’t they”, which rarely happens), but they do not add up to anything as exciting as that which we enjoyed this time. Then again, they cannot all be this exciting all the time. As far as let-downs go, next week will be just fine, especially with the Red River Shootout awaiting in first shift. Here are some quick, bottom-line thoughts. Ohio State wore the weirdest, most out-of-the-ordinary uniforms in the history of their storied program when they took down Penn State. Check it out. USC put up a great fight at Notre Dame, but sadly came up short. LSU and Florida slugged it out for a great game Saturday evening in Death Valley. Ironically, the go-ahead touchdown was scored by LSU’s kicker, a positive that he shall no doubt take to his grave, and deservedly so. 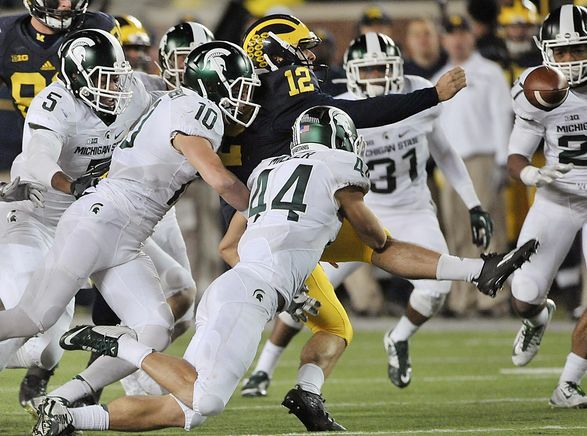 Meanwhile, Michigan State’s last-second win over Michigan – in the Big House, no less – will be one for the ages as well. Auburn has their “Kick-Six,” so it will be interesting to see what sort of moniker will soon be attached to the Spartans’ blocking of Michigan’s punt attempt, then running it back for the go-ahead score as time expired. Classic. The special, throwback helmets that Texas A&M wore looked positively awesome. Indeed, these are some of the coolest-looking, most college football-appropriate special helmets I have ever seen. Period. In case the significance is lost on people, this design of helmet was meant to be a throwback to the kind of helmets the Aggies wore when they won their only national championship – in 1939. Do the math, and this year marks the diamond anniversary of that occasion, hence the throwback-looking helmets. Way cool, in any case. Let’s hope they break them out again before the season ends! The South Carolina-Tennessee game seemed to leave more questions asked than answered. Just what accounts for South Carolina’s gross inconsistency? Is it their weak defense, or is it something more systemic than that? Will another good recruiting class help the Ol’ Ball Coach rectify this problem? Will Dylan Thompson’s QB play improve next year, with the experience he is gaining this year? On the other side of the coin, Tennessee seems to be one year away from having a really good team. All Butch Jones appears to need is to bring in one more recruiting class of players with the right kind of talent, but also who buy into his system, his approach, his way of doing things. Starting next year, they should be the team in the best position to win the SEC East, barring needed improvements on South Carolina’s end. Speaking of more questions asked than answered, the results of the Florida-Georgia game have certainly muddied the waters regarding Will Muschamp’s future. Everybody was prepared to write his epitaph and obituary notice before he pulled off a massive upset over the Bulldogs in Jacksonville, Fla. Does this win save his bacon for one more year, or is the die already cast? After all, Texas defeating arch-rival Oklahoma in 2013 did nothing to preserve Mack Brown’s tenure as head coach of the Longhorns (the connection being, Muschamp was once Brown’s defensive coordinator). Food for thought. In all the years I have followed college football closely (two decades and counting), I honestly cannot recall a weekend where the top-ten rankings were turned upside-down with upsets. Indeed, upsets abounded all over the place. To wit, Thursday night, Arizona went into noisy Autzen Stadium and upset the No. 2 Oregon Ducks. Friday night, Utah State beat deceptively-tough No. 18 BYU. 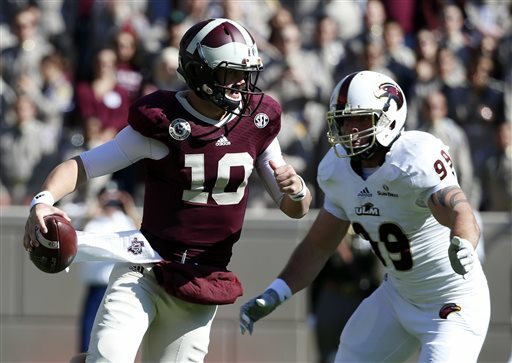 Then on Saturday during the noon timeslot, Mississippi State finally earned a big win over a top-ten opponent in Texas A&M. Following that, Ole Miss beat No. 3 Alabama. The last time the Rebels went 5-0, John F. Kennedy was in the White House. If that is not enough, TCU went into Norman, Okla., and upset the Sooners. Let us not forget that out on the West Coast, unranked Utah upset No. 8 UCLA out in the Rose Bowl. So, just so everybody is up to speed, the No. 2, 3, 4, 6, and 8-ranked teams all went down. Regarding Purdue’s win on the road at Illinois, it remains inconclusive as to whether or not the Boilermakers have improved that much since stinking out the joint against Iowa on homecoming weekend, or if the Illini are even more inept than Purdue. So with all the top-ten teams going down to defeat this past Saturday, how come No. 1 Florida State escaped unscathed? That would not have anything to do with the fact that they played Wake Forest, would it? With all the top-ten teams upset, it might have escaped the notice of many fans that unranked Northwestern also pulled off an upset over the No. 17 Wisconsin Badgers. Given the Wildcats’ mediocre performances thus far, none of us saw that one coming. I cannot help but surmise that the only thing the saved Notre Dame’s bacon at home against Stanford was the positively nasty weather that no doubt threw the Cardinal a bit off their game. Otherwise, the Irish might have (indeed should have) been exposed. For those of us who are waiting for the opportunity for Notre Dame to be exposed as the truly overrated team they are, mark your calendars for Nov. 8, when they play Florida State, followed by Nov. 22. On that date, they play the Louisville Cardinals. Just sayin’. The game that has been billed by the media and built up in the minds of many a fan nationwide certainly lived up to its billing/hype yesterday. No. 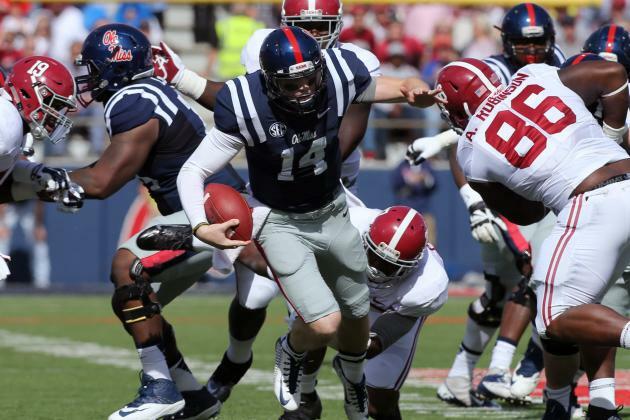 1-ranked Alabama is sure to retain atop the mountain of college football rankings after defeating the home team No. 6 Texas A&M in a thriller of a game. The key to the success of the Crimson Tide was figuring out how to contain the Aggies’ QB Johnny Manziel, by not allowing him sufficient access to the outsides of the hash marks and instead forcing him inside, up the middle (both of running and throwing) as a means of containing the threat of his talents. In the end, it worked. Best of all, “Johnny Football” seemed surprisingly humble, contrite, and team-oriented during the postgame press conference. After witnessing all of his antics the previous weeks, this was a rather pleasing development. Time will tell if he truly did learn a lesson or two from this loss, or whether he will devolve back to the cocky, reckless punk he was earlier. A curious case of both Michigan and Notre Dame arose this past Saturday. The former team had to struggle at home to beat the Akron Zips, and only doing so in the last minutes of play. Meanwhile, Notre Dame, an ostensibly revitalized, nationally viable team under head coach Brian Kelly, had to earn – in every sense of the word – a win against a Purdue team whose performance prior to this game was suspect at best. Perhaps this strange case is a result of a hangover from big game between the two the following week. Lots of media hype and team energy went into that game, and as anybody who has any real experience in college football can tell you, one of the biggest challenges in the sport is trying to get 19-20 year-olds to play consistently week in and week out. Or, it could be at both Akron and Purdue are better than we thought they were. Concerning the latter, it could have been that the Boilers were looking past Indiana State (could you blame them?) and devoted some extra prep time to dealing with the Fighting Irish. Certainly a plausible scenario, no? What remains intriguing about this case is that, in all likelihood, Michigan and Notre Dame will be just fine. But it could also be that Akron and Purdue are on the rise from the doldrums in which both programs have been stuck for the past several years. Time will tell. Meanwhile, Texas lost another game, this time at home, against a respectable opponent in Ole Miss. The Longhorns were supposed to have gotten things together, so we were told. After all, before last week’s BYU debacle (in which they lost 40-21), they were ranked No. 15 in the nation. This week, the Rebels came into Austin ranked #25. Yet the Horns lost again, this time 44-23. It is conceivable that Texas could turn things around and that the defense could get more settled under new defensive coordinator Greg Robinson. Or, it could be that the wheels are coming off the program, and as much as Longhorn Nation likes head coach Mack Brown personally, it is time for a changing of the guard. Right now, though, things are not looking good on the 40 Acres, and the prognosis for the second Saturday in October is not that rosy, either.